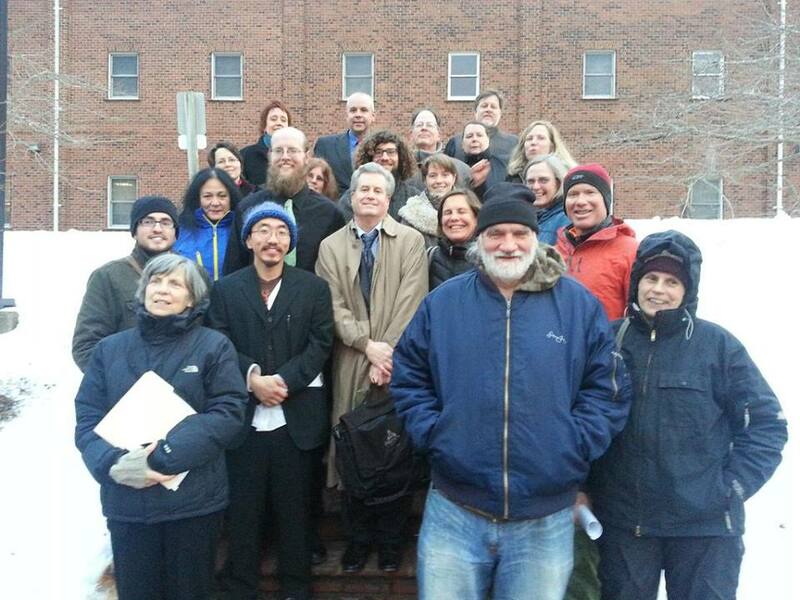 After the trials, the We Are Cove Point protectors, their supporters and attorney Mark Goldstone reviewed the day. Missing is Steve Norris, who was sent directly to jail. Steve Norris, a retired professor from North Carolina, is stuck in the Calvert County Detention Center for the next few days. That is not his chief concern, though. And he’s expressed no remorse for his crime. Steve Norris (above) and Clarke Herbert (below) used bike locks to attach their necks to door handles at a Dominion contractor’s office. The Federal Energy Regulatory Commission (FERC) approved the $3.8 billion facility in September, and Dominion began construction while an appeal is in the works. Norris was the only defendant jailed among the 20 people sentenced Monday for charges related to actions in November and December designed to raise awareness of the threat to public safety from Dominion’s planned facility in Lusby and its connection to climate change. Most —including Clarke Herbert, who also locked his neck to door handles at Kiewit — received 20-day suspended jail sentences, some with credit given for time served; three years of unsupervised probation, during which they must obey all laws; and $157.50 in fees ($100 fine and $57.50 in court costs). Norris, who had several similar prior charges in other jurisdictions, was taken directly to jail from the courtroom and will be released Thursday at 6 a.m. Early in the afternoon, Goldstone started arguing a “necessity defense,” explaining that the defendants’ actions were to prevent a greater harm. “We’re not getting into that,” Judge Saunders said. And yet with each pre-sentencing statement and some testimony, the defendants “got into that,” creating a court record of all that is at stake. 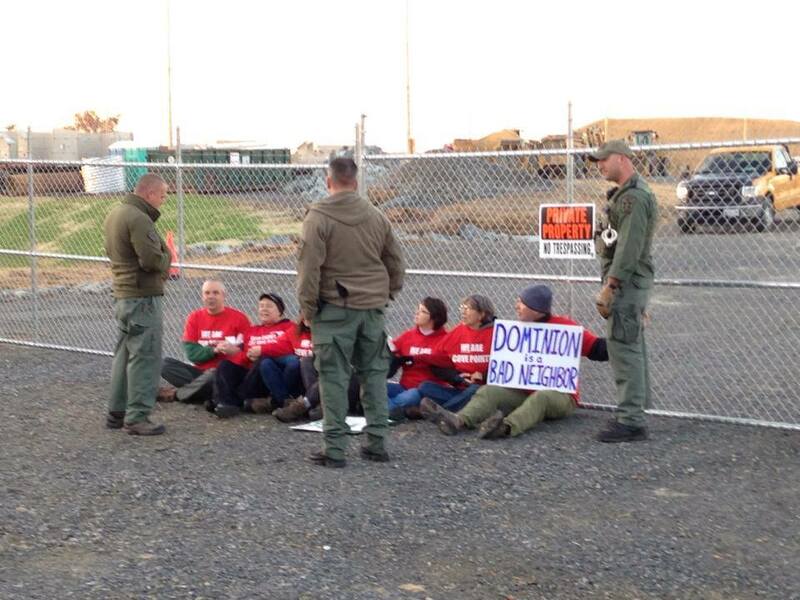 At the top of a pile of Dominion’s construction dirt, a Calvert County sheriff confronts Cove Point protectors. Some of the defendants told Judge Saunders that they preferred jail time, but she stuck with the suspended sentences and lengthy probation. Several said they would not likely be able to stay on the sidelines. “I dedicate my life to this struggle,” said Charles Chandler, who had walked and camped from Ithaca, N.Y., to Cove Point —360 miles over 27 days — and who wore a bright orange jacket with his website in large block letters on the back: PeaceWalker.net. “You’ll probably see me again. I plan to participate in unlawful, peaceful protest. If we just hold signs on the sidewalk, the corporations will just keep rolling on over us. … We’re condemning our children and future generations to a garbage planet.” Without climate justice, there is no peace, he said. Protectors, including Greg Yost at left, link arms at a Dominion gate. “I can’t sit passively while [Dominion’s facility] is built,” Kelsey Erickson said. Dr. Margaret Flowers, a co-director of Popular Resistance who for 15 years was a practicing pediatrician, called on Judge Saunders to help expose the secrecy around Dominion’s project. She said the company lied about the number of people nearby, about the families across the street and the 2,365 homes, 19 home day-care centers and two elementary schools within 2 miles that have no evacuation route. At that, several spectators applauded but were immediately told to be quiet. The only other break from courtroom decorum came during one of the brief recesses. A group of half a dozen or so people started singing “We shall not be moved,” prompting evictions from the courtroom of several people — including Norris, whose case had yet to be heard. The defendants fell mostly into two camps. They were retired and feared for the future of their children, grandchildren and great-grandchildren. Or they were young adults, facing a decidedly bleak future — unless they and others intervened. “I’m motivated by this really serious fear of what the future holds,” said 20-year-old Elias Weston-Farber, who is often the videographer at civil disobedience actions. “Science is telling really important things about our economy and our way of getting energy,” he said. Some charges were dropped along the way. When prosecutor Michael Gerst, assistant state’s attorney, argued during the case of the dirt pile that “protest does by its nature draw attention and that is the definition of disturbance of the peace,” the judge indicated that Goldstone needn’t bother to counter: “You’re going to win that,” she told the defense attorney. In the bike lock cases at Kiewit, Kevin Zeese, an attorney and co-founder of Popular Resistance, testified for the defendants that his role at that action was as police liaison to prevent escalation. The goal was to get an image of Norris and Herbert locked to the doors, “to let the world know Kiewit is involved in this dangerous project.” The action lasted perhaps 20 minutes, until police cut the locks. Only two doors were blocked, so no one was trapped in the building, he said. Passersby were handed literature and were watching and interested. Gerst, the prosecuting attorney, argued that people and businesses “stopping their normal daily activity” was a disturbance to the peace. But Goldstone, who wore a “We the People” tie with writing from the U.S. Constitution, successfully argued that protests are designed to create an informed electorate. “It’s not a crime for people to speak out or for people to stop and find out what is going on.” Norris, who was acting as his own attorney in the case, said Gerst’s claim was similar to “blaming civil rights’ protesters for the violence [committed] by the people who didn’t like it.” Judge Saunders dropped all but the trespass charge in that case. This morning, Eno spoke at the Calvert County Commissioners’ meeting, her 19th presentation to the officials about the hazards of the Dominion project. We Are Cove Point protectors, many with red arm or neck bands, prepared for trial with their supporters. UPDATE: Steve Norris was released from jail Wednesday morning, a day early. He reports that he had great conversations with his fellow inmates about Cove Point. In Western Maryland last week, the Marcellus Shale advisory commission and state officials scrambled to finish reviewing three years of studies on whether to proceed with fracking in Maryland. The election the night before, though, shifted the landscape utterly. The few commissioners who have consistently raised concerns about fracking in Maryland recognized that whatever safeguards were in the works, insufficient though they might be, could be dismissed by the newly elected governor, Republican Larry Hogan. What the science was starting to show about the health, economic and environmental hazards for the many could be ignored for quick profit for a few. Meanwhile, at the other end of the state and in Washington, DC, a week of peaceful and bold protests was under way, showing what people will resort to when their fears are ignored, their lives disrupted, their communities shattered, and their remaining choices few. 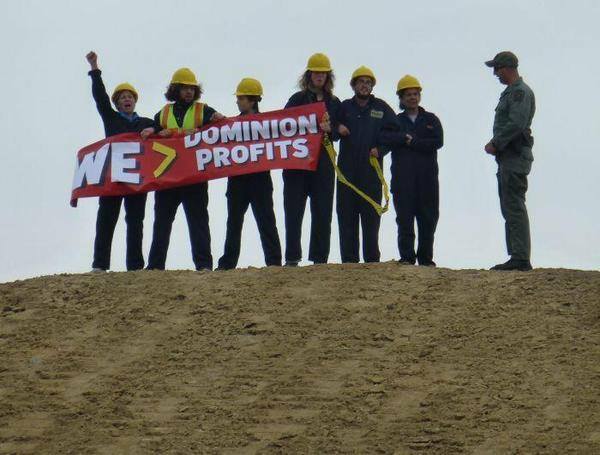 As part of a week of actions called Beyond Extreme Energy (BXE), determined protesters headed for Cove Point and briefly took over a dirt hill where Dominion is building a pier for a fracked-gas export facility. Another protester locked herself to Dominion equipment at a predawn sit-in. 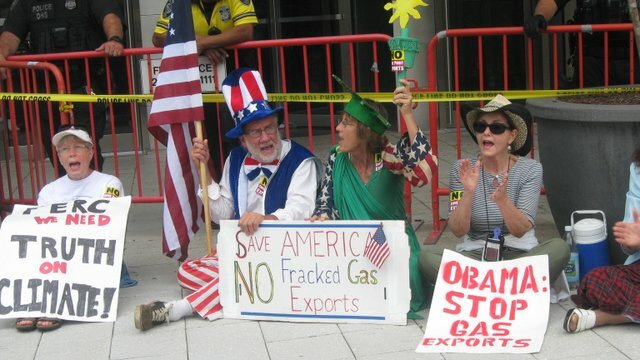 In Washington, BXE activists blocked entrances at the Federal Energy Regulatory Commission (FERC), the mostly invisible and always intractable agency that rubberstamps pipelines, compressor stations and export facilities and is therefore the chief patron of the fracked-gas industry. The industry — and industry-bought politicians — have promoted fracked gas as clean energy and a solution to climate change when science and experience shows it is neither. In all, about 80 people were arrested over five days in Washington and Cove Point. Some protesters had just finished walking across the country as part of the Great March for Climate Action. 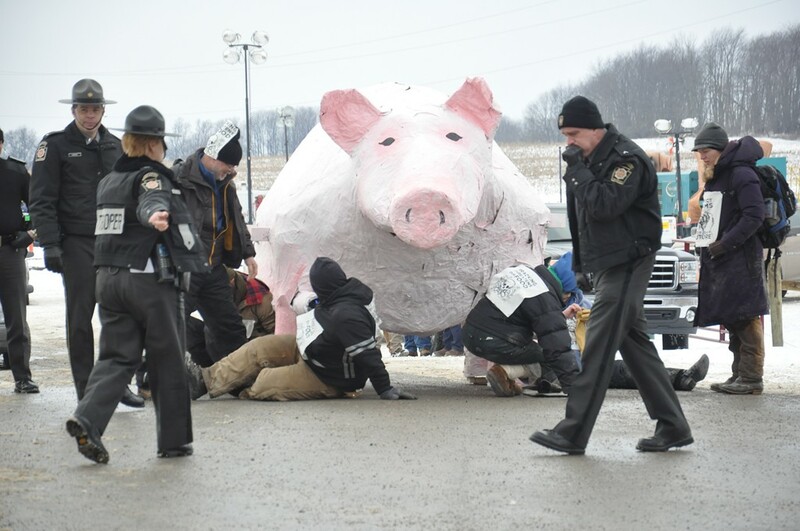 In addition, 15 people were arrested blocking a FERC-approved gas storage facility in salt caverns on Seneca Lake, NY. On Monday, protesters blocked the main entrance with giant photographs of Rachel Heinhorst and her family, who live across the street from Dominion’s Cove Point front gate, and the Baum family, who live near a giant compressor station for fracked gas in Minisink, NY. In front of the portraits was a small town of shops and homes, schools and parks. Homeland Security officers guarding FERC offices eventually pulled apart this little village, much as FERC destroys communities with its rulings. On Friday, the final day of the protests, residents of the Pennsylvania shalefields told tearful yet angry stories to FERC staff who were blocked from their offices and who had gathered on the sidewalk to watch police cut out five activists linked by lockboxes. “You have no right to poison people,” said 61-year-old Maggie Henry, who was labeled an ecoterrorist in an FBI Joint Terrorism Task Force report. Her family’s 88-acre organic farm, mentioned in a 2009 New York Times article, is surrounded by the fracking industry. A mile away is a cryogenics plant; 4,100 feet away is a frack pad; a fracked-gas pipeline skirts the land, a gas-fired power plant is being built a few miles away. Four homes three miles away have replacement water tanks: “Water buffaloes dot the Pennsylvania landscape like lawn ornaments,” she said. An earthquake in March from nearby fracking damaged her home’s foundation and cracked the drywall. That farmhouse, which has been in her husband’s family for 100 years, sits empty and she is searching for land elsewhere. “I don’t have the nerve to tell people [the food] is organic,” she said, because of the nearby emissions of carcinogens, neurotoxins, endocrine-disrupters such as toluene, ethylene, butylethylene. BXE protesters called on FERC to repeal permits for the Cove Point export plant, the Myersville and Minisink compressor stations, and the Seneca Lake salt-cavern storage facility; to halt future permits for fracked-gas infrastructure; and to consider as a priority the rights of human beings and all life on Earth. Back at the Eastern Garrett Volunteer fire hall in Finzel, members of the shale advisory commission were reviewing the last three studies, all done by the staff at the state Departments of the Environment (MDE) and Natural Resources: a 241-page risk analysis, a 7-page traffic study and a climate study that barely runs over onto a fourth page. The greatest risks to humans, the report concludes, would be from truck traffic and accidents, noise, and methane migration to water wells. The last of those perils, the report says, could be reduced to a low risk if fracking operations are at least 1 kilometer (3,280 feet) from drinking water sources. (The state’s best practices propose a 2,000-foot setback from drinking water sources, with reductions allowed under some circumstances.) The greatest threats to the environment are from fragmenting forests and farms, and “subsurface releases or migration” — underground leaks — of frack fluid and frack waste. All the risk levels assigned assume that the state’s best management practices will be in place and enforced. “We don’t know what the level of enforcement is going to be, we don’t know how many staff are going to be hired,” said Matthew Rowe, the MDE deputy director of the Science Services Administration who led the study. “There’s no way you can verify and enforce some of these [best practices],” Commissioner Ann Bristow said, “but you use them to reduce the risk.” She called this one of the Catch-22s of the study. “What I hear you saying is that because it’s occurring to a very small number of people, the risk isn’t that great,” Roberts said. “We are talking about human beings who are living close to these facilities … where there is going to be considerable adverse effect,” Bristow said. Then ensued a brief discussion about how many people harmed is too many. Three? 500? Bristow said they would be “sacrificed.” Commissioner Harry Weiss objected, but Bristow said, “I am going to use some superlative language here” when so much is a stake. Also troubling was that the risk study labeled many threats as “moderate,” which at first glance sounds downright reasonable and benign. All things in moderation, as they say. But, Bristow and Roberts said, the study defines moderate as: “Considerable adverse impact on people or the environment. Could affect the health of persons in the immediate vicinity; localized or temporary environmental damage.” Suddenly, moderate is sounding rather grim. And keep in mind that all but four counties in Maryland lie on top of shale basins. Commissioner George Edwards, re-elected state senator in the Republican rout of the night before, was getting impatient. Worried about trucking? A distribution center brings traffic, too, but no one would ask for a risk study on that, he said. Forest fragmentation? Wildlife and hunters like it, he said. You can’t get 100 percent guarantee on anything, he also said. And, mocking Trout Unlimited’s push for a ban on fracking in the Savage River watershed, Edwards said, “Maybe we need to do a study on the fishermen to see if they might get hurt if they slip on a rock.” One of the commissioners, Nick Weber, who had long pushed for the risk study, is a past chairman of the Mid-Atlantic Council of Trout Unlimited. “You are going to see a big change in Annapolis this year,” Edwards said. “We had an election. … People went and voted, and they elected people that publicly said they supported drilling but they want it done right.” He also mentioned that he had not read the risk analysis. Protests continued Monday at Cove Point, where Lusby resident Leslie Garcia was arrested while trying to deliver an eviction notice to Dominion. About 50 residents and other supporters picketed at the entrance of the construction site. “I have nothing to lose by protesting, because I have everything to lose if this project continues,” Garcia said. Between naps at a meeting last week about a Cove Point wetlands permit, Gov. Martin O’Malley apparently woke up long enough to decide that fracking could be done safely in Maryland. Even though his Marcellus Shale advisory commission is still wading through reports that raise plenty of alarms. The big reveal came at a daylong session of the state Board of Public Works (BPW), of which the governor is one of three members. On the agenda was Dominion’s permit for a temporary pier, which the company needs to haul in equipment for its proposed facility on the Chesapeake Bay that would liquefy fracked gas and send it off to Asia on huge tankers. Most of the permission slips for this $3.8 billion project come from the Federal Energy Regulatory Commission, but the state has had a couple opportunities to weigh in. Already the Public Service Commission (PSC) gave the go-ahead for Dominion to build the 130-megawatt power plant needed to liquefy the fracked gas. In its April ruling, the PSC listed numerous hazards and said the facility “will not provide net economic benefit to Maryland citizens,” but whatever. The PSC said Dominion would have to pay $8 million a year for five years into a fund for renewable energy, energy efficiency and greenhouse gas mitigation and another $8 million over 20 years to help low-income residents pay for their rising — thanks to the exports — heating bills. Last week, Dominion needed permission from the BPW for a wetlands-disturbing pier. Cove Point residents seized that opportunity to tell O’Malley, who had so far been silent on Dominion’s plans, that this facility has them fearing for their lives. Lusby resident Tracey Eno, however, noticed that O’Malley kept nodding off and at one point walked out. “I’m sorry that the governor stepped out because this is really for him. Should I wait?” she asked. She was told to continue, although she backtracked when he returned. Moreover, no study has emerged showing fracking can be done safely. To the contrary, evidence is mounting that fracking poses grave threats to public health and safety, water, air, farm animals and pets, industry workers, soil and agriculture, and climate. The Concerned Health Professionals of New York has compiled the research to date in a 70-page report. “The pace at which new studies and information are emerging has rapidly accelerated in the past year and a half: the first few months of 2014 saw more studies published on the health effects of fracking than all studies published in 2011 and 2012 combined,” the report says. And in Ohio, news comes that Halliburton withheld complete information about its secret fracking brew for five days after a fire and explosions in June sent toxic chemicals into a tributary of the Ohio River, threatening the drinking water supply for millions of people and killing 700,000 fish. Governor O’Malley, however, appears to be looking the other way. Perhaps at campaign checks from America’s Natural Gas Alliance. Without bothering to wait for his commissioners to issue a report, the governor has decided that fracking can be made safe for Marylanders. One might wonder whether his shale advisory commission has been a charade all along. 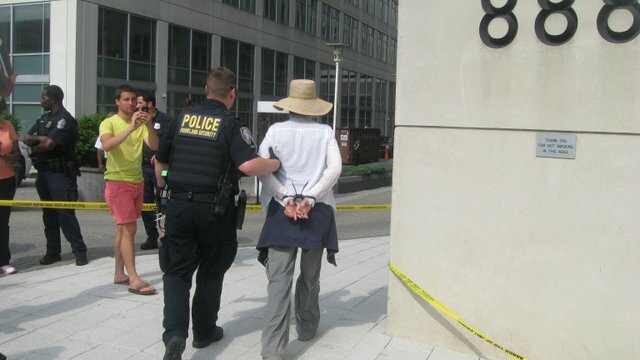 Among the 25 arrested for civil disobedience at the Federal Energy Regulatory Commission (FERC) in Washington this week was Ann Bristow, a member of Maryland’s Marcellus Shale advisory commission. Also arrested was Gina Angiola of Olney, a retired doctor on the board of directors of Chesapeake Physicians for Social Responsibility. Another was a retired teacher and borough officer from Pennsylvania, Mike Bagdes-Canning, who last month traveled to Garrett County for the unveiling of the final progress report on Maryland’s health study on fracking. There, he issued a warning to Marylanders not to do what his state has done. 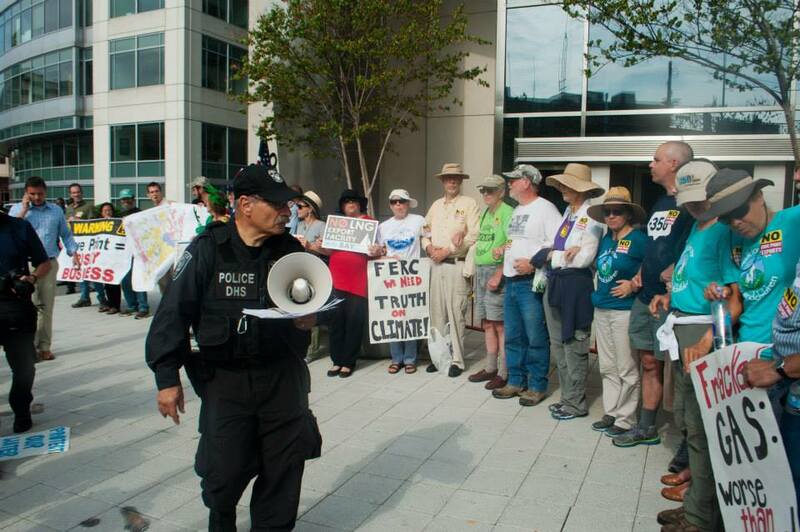 The civil disobedience came a day after Sunday’s spirited rally and march to FERC. 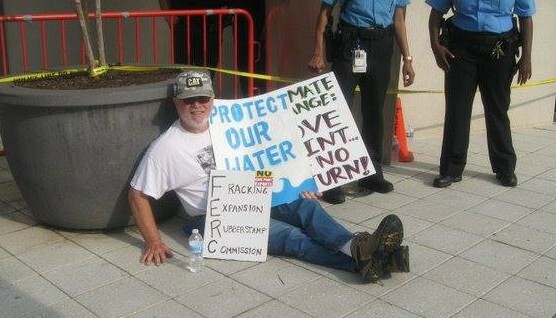 The actions also followed a week of lunchtime picketing in front of FERC’s offices at the end of June. 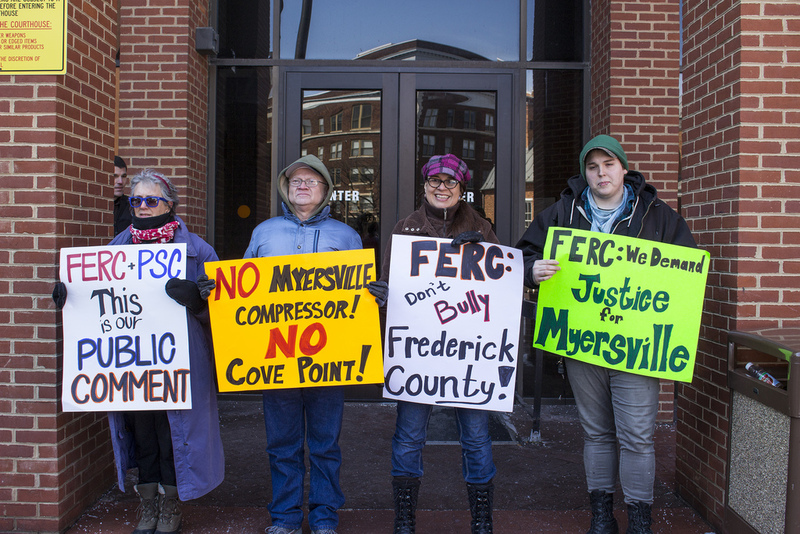 The trigger for the protests was FERC’s full-of-holes preliminary approval of the plan by energy giant Dominion to liquefy and export fracked gas from its Cove Point terminal in Lusby. But the protests united groups fighting every stage of shale gas extraction and production: the fracking with secret toxic chemicals, the truck traffic and diesel-fired equipment, the radioactive waste that has no safe disposal, the flaring, the methane that leaks into water wells and disrupts the climate, the forests fractured and the land taken by eminent domain for pipelines, the noise and pollutants from compressor stations, the unthinkable hazards from the export factory. Those protesting came for their children and all children, for grandchildren and future generations, for rivers, mountains and farms, for people trapped by encroaching destruction, for clean water and air, for wolves, turtles and hawks. Monday morning, as he headed out to be arrested at FERC, Bagdes-Canning got 36 phone messages from people in the shale fields. “They are with us,” he told the others. 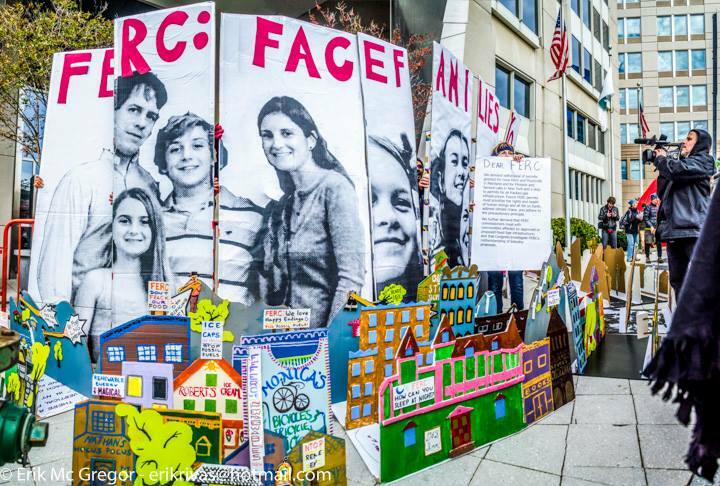 That morning, a few dozen people headed from Union Station to FERC’s offices, chanting “HERE WE COME, FERC” and “WAKE UP, FERC.” The pipelines and compressor stations FERC allows as a “public necessity and convenience” mean communities are gassed and fracked, they said. 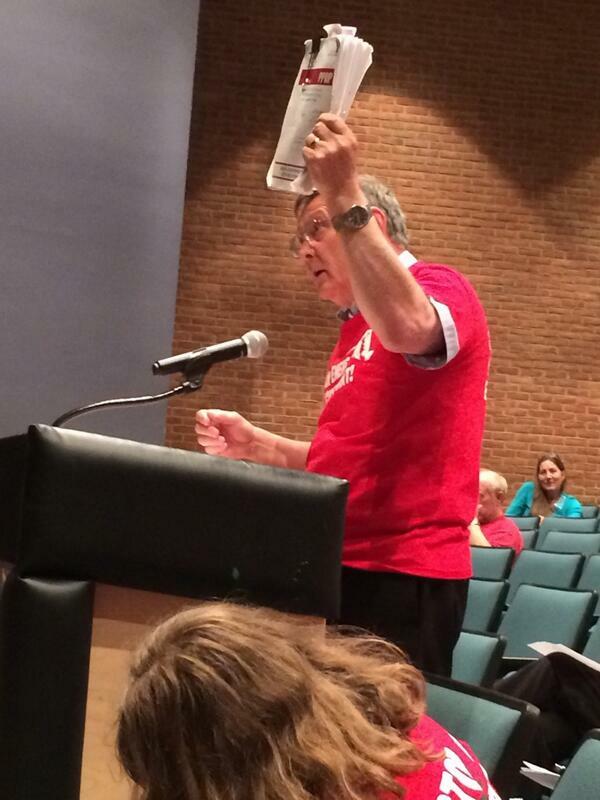 “As a public necessity and convenience, we are stopping FERC,” another protester from Pennsylvania shouted. 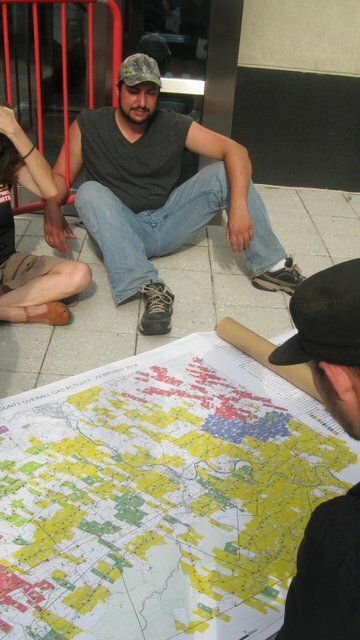 As he sat in front of FERC’s doors, Alex Lotorto spread out large maps covered with color-coded rectangles signifying drilling companies and land leased for fracking over much of Bradford County in northeast Pennsylvania. Shell, Chesapeake Energy, Talisman Energy, EOG Resources, Chief Oil & Gas, Southwestern Energy. After a couple hours of constant maneuvering to try to block both entrances as well as driveways adjacent to the building, 25 activists were arrested. They were handcuffed, escorted a few hundred feet to an office for processing, fined $50 and allowed to leave. Bristow joined the shale commission late, replacing a resigning member. As a volunteer with the state Department of Natural Resource (DNR) Marcellus Monitoring Coalition, Bristow arrived with a background in monitoring water quality. During the past two years, though, research in states that have allowed fracking is showing that air contamination — from compressor stations and condensate tanks and particularly from “wet gas” — could pose an even greater hazard, she said. 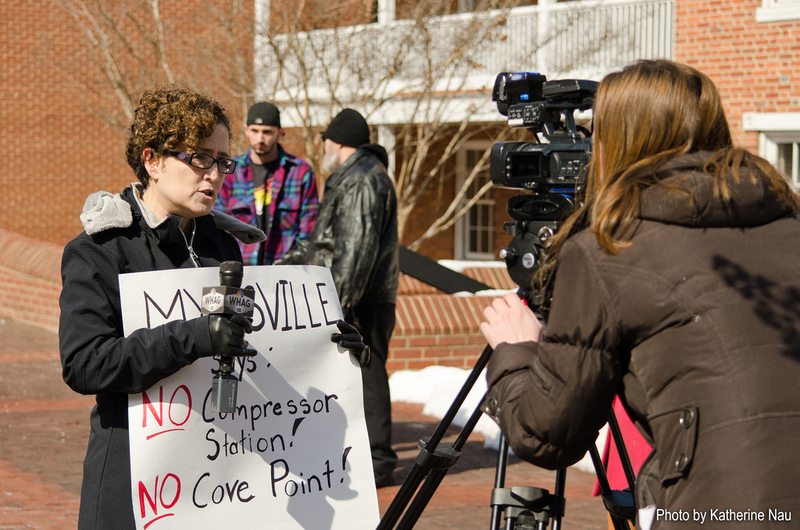 Already, she said, the compressor station in Accident in Garrett County is processing and storing Marcellus gas from Pennsylvania; another is being built in Myersville, with a portion of the gas eventually headed for Cove Point. The state should “measure toxic air emissions at existing facilities … and measure air quality at Myersville before and after completion of the compressor station,” she said. In a few months, based on recommendations from the 15-member advisory commission, MDE and DNR will send a report to the governor with conclusions about whether or how fracking could be done safely in Garrett and Allegany counties. Only four commissioners, including Bristow, have expressed abundant concerns and pressed for caution. Gina Angiola, the retired physician arrested at FERC, is on the steering committee of Chesapeake Physicians for Social Responsibility. If built, Cove Point would endanger thousands who live near the facility and increase fracking across the region, “further feeding our unsustainable fossil fuel addiction,” she said. “A few people will get wealthy, many more will be harmed. The marchers head for FERC. //photo by Beth Kemler at CCAN. She said she spent the Fourth of July weekend with members of the Dryden Resource Awareness Council. There, they talked of tomatoes, grandchildren, recipes and arthritic knees and hips, she said. “Did you catch that? The people of Dryden, who brought the world’s largest industry to its knees, have arthritic knees. But they are motivated by love. Love for the place where they live and love for the people who will come after them. They feel a responsibility to protect what they love. Because that’s what love means,” she said. More inspiration from the past: Forty years ago, residents in Rossville, NY, fought another seemingly long and impossible battle against storing liquefied natural gas (LNG) in tanks in their town. For 13 years, united as Bring Legal Action to Stop the Tanks (BLAST), Rossville residents “ignored the counsel of those who said that it couldn’t be done. That the tanks were already built. That of course they would be filled with LNG. That it was all inevitable. That you couldn’t fight the Federal Energy Regulatory Commission. But in the end, BLAST won,” Steingraber said. In part, it won because of an LNG explosion in 1973 that killed 40 people and led New York to ban LNG facilities. All the LNG hazards present in 1973 remain, Steingraber said, including that it will flash-freeze human skin and, if spilled, will disperse as a highly combustible vapor cloud and that an LNG fire is not extinguishable. Plus now we know about fracking and about climate change. “We New Yorkers Against Fracking pledge our support, assistance and solidarity with our brothers and sisters in Maryland who are fighting the LNG terminal in Cove Point. Our destinies are intertwined. Our success depends on yours,” she said. The present consumes Rachel Heinhorst, whose family’s front lawn faces Dominion’s front lawn in Lusby. “We do not deserve to live in fear of an explosion, of the water we drink, of the air we breathe,” she told the crowd. “FERC and President Obama, please hear my family and all the others living so close to this. Feel our worry, know that it is real, know that we are coming to you, not looking for a fight. We are coming to you looking for compassion.” Her family, though, is preparing to move. If they can sell the house. 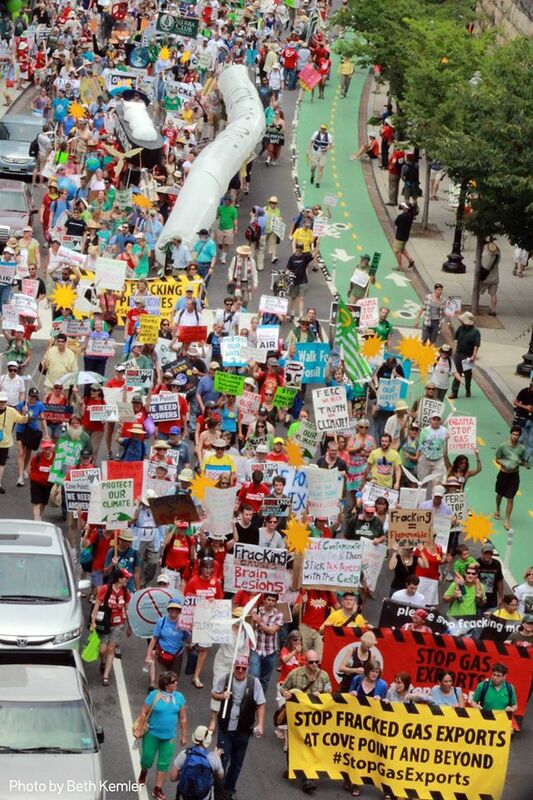 As a frontline resident in the shalefields of Pennsylvania, the rally on Sunday and the action on Monday were as much about us in Pennsylvania as about the people at Cove Point. Cove Point and the other export facilities are critically important to those of us in extraction communities because once the gas is available on a global scale, it will command a “global price.” Shale gas is very expensive to produce, and it is not profitable to extract at the moment. That will change if it hits the global market. The dire circumstances we find ourselves in now will be viewed as the good old days. “Extreme energy threatens us all.”//photo by Tom Jefferson. In addition, though, we are all from frontline communities. Creating a world market for LNG would be devastating to humanity and much other life as we know it. That point was made at the rally. It wasn’t an accident that my friend Cherri Foytlin from the Gulf region was a speaker — we, all of us, need to be in this fight. Your fight is my fight, my fight is your fight. This all became very personal for me today. I spent the entire morning with some of the folks I’ve been working with — trying to keep drilling away from a school campus that serves 3,200 kids. They had a hearing with our Department of Environmental Protection (DEP — we call it Don’t Expect Protection). 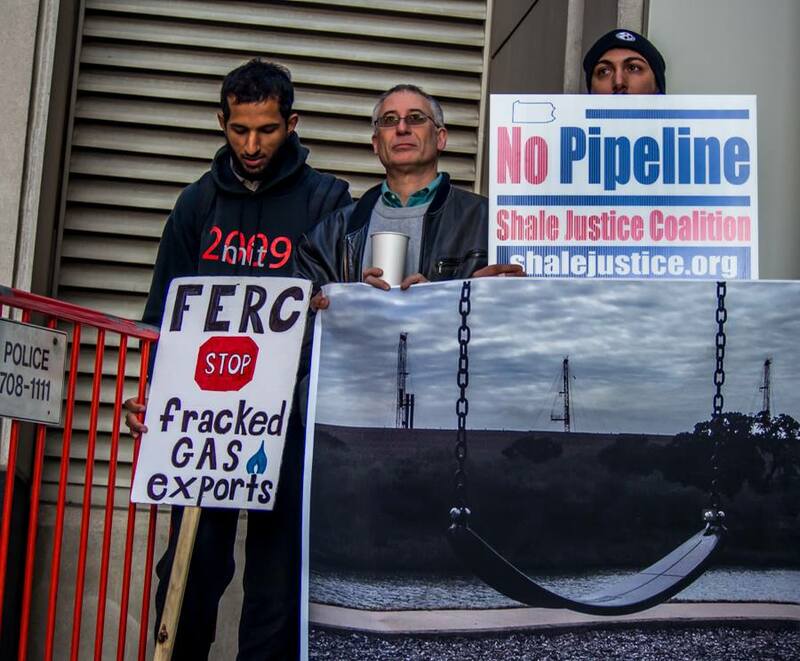 I was there as a member of the media: I document shale stories for the movement. I was kicked out of the meeting because our law does not serve the people. It serves the corporations. Then I had to deliver my friend, photographer Tom Jefferson, back home to Pittsburgh. Tom wasn’t allowed into the meeting either. Finally, after spending most of the day on the road, I was grateful to be heading home to my piece of heaven — Cherry Valley. At a little after 7 p.m., after being away from home for 11 hours, I turned onto my road, and about a half-mile south of my driveway, I came upon a crew doing seismic testing, one of the initial steps in the drilling process. There was a sign in the road that said, “Lane closed.” I got out of my car and stormed past the flag-man, pulled out my camera and started to document. They told me that I had to leave; I told them I wasn’t going anywhere. THIS IS MY HOME! They told me to back away, it wasn’t safe. I told them that I wasn’t going anywhere, they weren’t welcome here. They had to think I was a raving lunatic — and I was. Even now, hours later, I’m angry and already contemplating my next steps. The arrest in D.C. will not be my last. Karen’s and my home is surrounded by properties that have been leased. Some of our immediate neighbors have not leased, but the folks that adjoin them have. We are a small island in a vast sea of leased properties. Both major political parties have betrayed us. Our government serves those who would destroy us. It’s up to us to draw a line in the sand. Day in and day out, I deal with folks who have been harmed, folks who no longer feel at home in their homes. Today, I find myself joining their ranks. My peace has been yanked from me. There is, however, a difference between me and those people I work with, the folks I’ve come to call friend, neighbor. I can’t tell you how many times I’ve heard: “What can we do? They’re so big, and we’re so small.” I know what I can do. I can fight within the broken system we’ve been given. I can put my body in front of machines. I can turn to my network of frack-fighters. I can gain inspiration from my heroes on the frontlines — people like Janet, who despite being without water for over three years and in ill health, has single-handedly carried a water bank serving others without water. I can gain inspiration from folks willing to put themselves in harm’s way. This fight is not mine any more than Cove Point is a fight for Marylanders. I don’t care where you’re from, your home is in danger. Extreme energy threatens us all. I’m not asking you to come to fight fracking in Pennsylvania. I don’t care where you are, you’ve got a battle to fight where you are. If they aren’t extracting, they’re transporting, or processing, or burning, or disposing of the waste. I want you to fight your fight because you will then be supporting me in my fight. Your victories will be my victories. We’ve got to fight the extreme energy industry at every step of its death cycle. We’ve got to be prepared to meet them wherever they are. My thoughts turn to our friends on the Great March for Climate Action. I’ve followed their progress and know that they, more than I, are seeing just how our struggles are one. At the foot of West Virginia’s Blair Mountain, filmmaker Josh Fox (“Gasland”) said that mountaintop removal and fracking were just two heads of the same monster. I’ve come to realize that the monster has many heads. And now I find, jarringly, that what I always knew but never really acknowledged has come to pass: My home is in danger. I’ve been there to support others, but now I feel very vulnerable, unsafe, fearful. It’s not a pleasant place to be and it’s uncomfortable to admit that I’m not ready for it. In my dealings with others, I’ve always assumed that I’d be ready, and now I find that working with others has not prepared me for what I’m facing. My involvement in this movement has made me a better person (though I’m betting that seismic crew didn’t think so). I am inspired by all my friends in this fight. Send me your energy, fight your fight. In December, I spoke briefly on the phone with a Dominion spokesman. Near the end of our conversation, I mentioned concerns about fracking. “Oh, we won’t be doing any fracking at Cove Point,” he rushed to assure me. 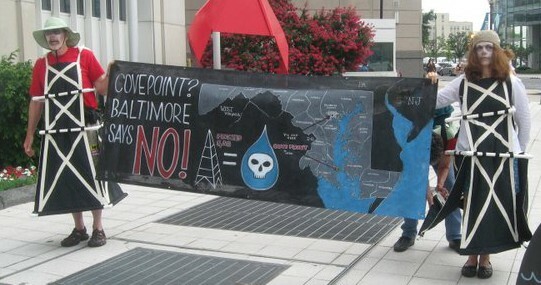 We know that no fracking will take place at Dominion’s Cove Point facility. That remark, however, shows Dominion’s duplicity throughout this approval process. Its stance has been that the shale-gas liquefaction and export facility proposed for Cove Point has nothing to do with fracking. And yet, this project has everything to do with fracking. That is the only source of the gas. To approve the project is to require the fracking. And with that shrug of its regulatory shoulders, FERC dismissed all harm from this project of fracking, pipelines and compressor stations next to our homes and schools, parks and rivers. Even as the List of the Harmed steadily grows. Even as research mounts about the threats to our health, especially for pregnant mothers and children. Even as illness and water contamination from methane, radon and hormone-disrupting chemicals comes to light despite industry’s efforts to hide behind nondisclosure agreements. Even as health professionals repeatedly call for a fracking moratorium. In addition, FERC’s review says that methane, which leaks at every stage of gas exploitation and transmission, is 25 times more powerful as a greenhouse gas than CO2. That ratio is over 100 years, an arbitrary and useless time frame. We don’t have 100 years. Over 20 years, according to the International Panel on Climate Change, methane is at least 84 times more powerful than CO2. FERC needs to redo the math. 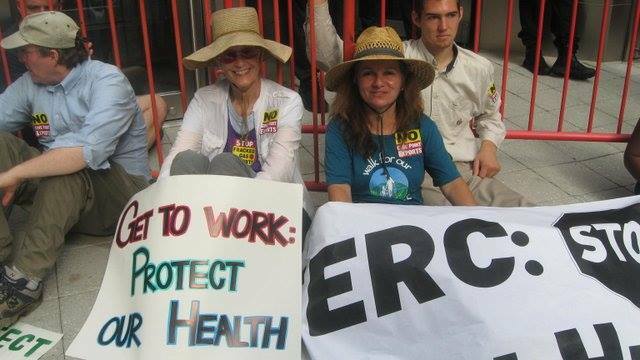 If FERC had conducted its highest level of review and bothered to calculate the damage to our health, economy, environment and climate from fracking millions of metric tons of gas a year to ship to Asia, the agency could not have approved this project. 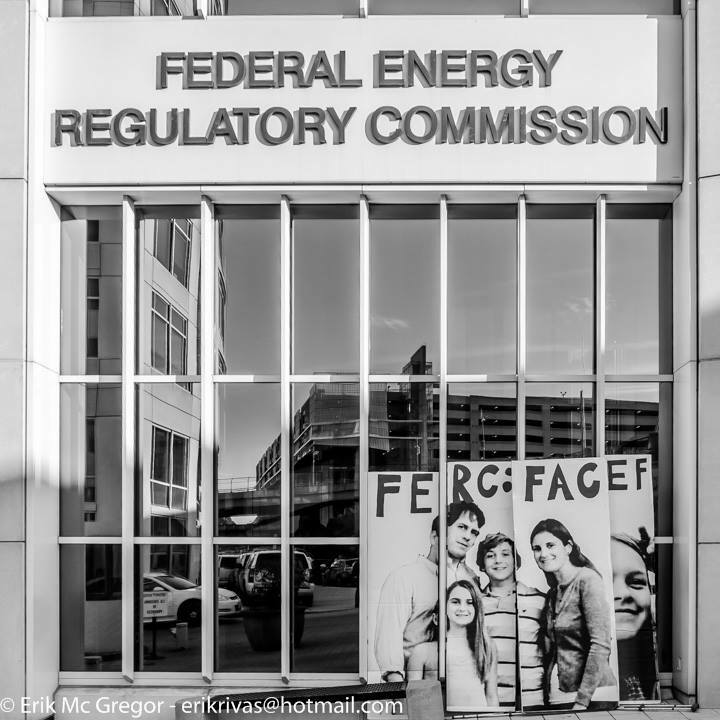 Once upon a time, FERC’s approval of every energy project imaginable raised few questions. That template no longer works. Because of the twin threats from our poisoned planet and climate change, we can no longer afford to have FERC be the handmaiden to the fossil fuel industry. On Sunday, July 13, we’ll tell President Obama and FERC to get this right. 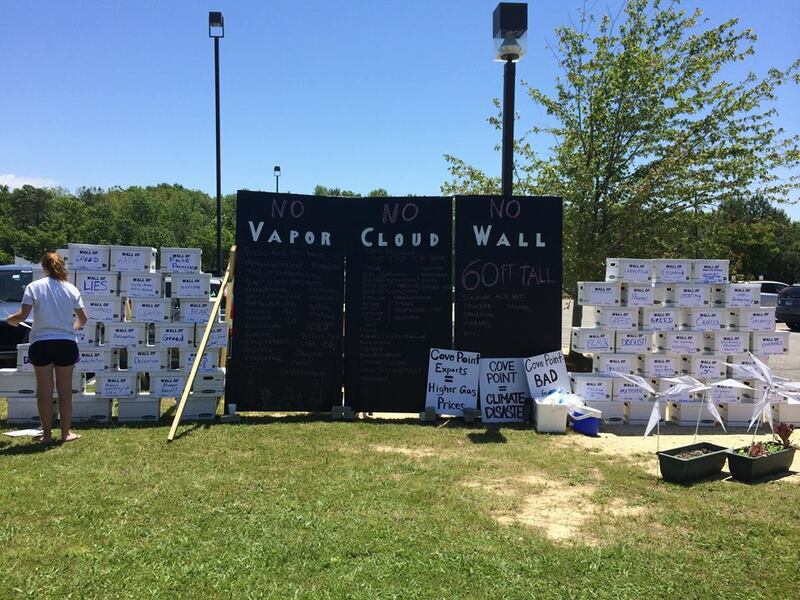 A mock vapor-cloud wall suggests what’s at stake from Dominion’s plans for Cove Point. 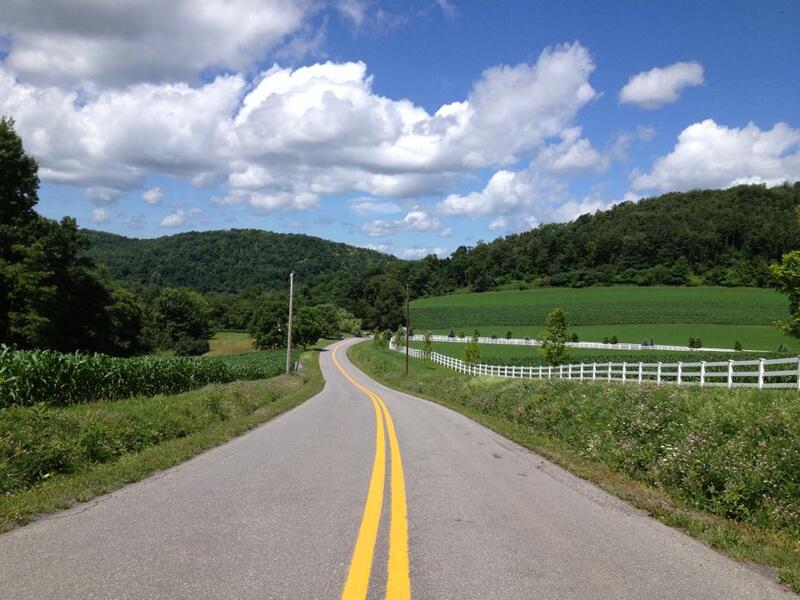 //photo from Calvert Citizens for a Healthy Community. Outside was the mock vapor-cloud wall. Listed on the mock wall were the air pollutants and carcinogens that Dominion’s proposed plant would routinely or accidentally send from its compound into the lungs of playing children and their parents. Forming part of the mock wall were boxes with labels, each written on by opponents of Dominion’s plans: Wall of Shame, Wall of Poisons, Wall of Cancer, Wall of Decreased Property Values, Wall of Corruption. Inside the Patuxent High School auditorium in Lusby was the seemingly impenetrable wall of the Federal Energy Regulatory Commission. Also possibly mock, as two FERC staff members and a court reporter — instead of the commissioners — sat at a table on the stage Saturday for this single public hearing on the environmental review of Dominion’s planned facility that would liquefy and export fracked gas. FERC concluded in May that the facility would pose no significant risks. Outside, Dominion erected a tent and catered pulled-pork sandwiches and side dishes for its mostly blue-shirted supporters. 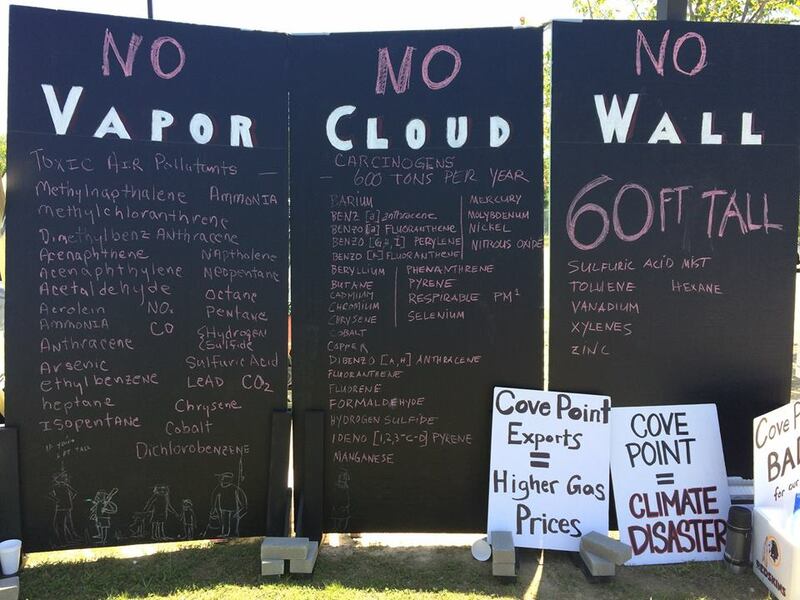 Between the Dominion tent and Chesapeake Climate Action Network’s mock vapor wall, Chesapeake Earth First! and Food Not Bombs set up a card table and handed out brown bag lunches with peanut butter and jelly sandwiches, an apple and a banana to the mostly red-shirted opponents waiting in line to enter the school. Initially, opponents of the project and the real vapor wall had wanted to set up the replica in another spot opposite Dominion’s tent. But an officer had rejected the idea. “This is their event. This is their expansion,” the officer told Lusby resident Tracey Eno. By “their,” he meant Dominion’s. Back inside, the FERC staff seemed earnest enough and extended the hearing an extra 90 minutes, until 7:30 p.m., giving everyone who had signed up a chance to speak. Anyone who could wait that long, anyway. Drew Cobbs’ name was called out in the late afternoon, but the executive director of the Maryland Petroleum Council was long gone. One of the FERC staff, Environmental Project Manager Joanne Wachholder, became tearful while praising the patience of 13-year-old Katie Murphy, who spoke late in the day. “Please stop this expansion. You might just save some lives,” Katie said. “I’m so glad you got to talk,” Wachholder said, rising and walking to the edge of the stage to offer a box of doughnuts to the girl. Mostly, the staff listened intently, took notes and kept track of time, cutting off the very few who went beyond the allotted three minutes. Those in favor called Dominion a “great corporate citizen” and the project a source of jobs and tax revenues and perhaps a pool for the high school. “This is about jobs, about good family-sustaining jobs,” said Mark Coles of the Building and Trades Council. Tax revenues would pay for teachers and public safety, said Brad Karbowsky, a Huntingtown resident and member of United Association of Plumbers and Pipefitters. Kelvin Simmons of the Lusby Business Association said he had confidence that Dominion would protect the Chesapeake Bay. “All construction jobs are temporary,” said Austin Pacheo, whether 2 days, 2 weeks or 2 months. These jobs, he said, would last three years. Where proponents see jobs, those opposed see poisoned air, the threat of a catastrophic fire, and increased fracking with accompanying pipelines and compressor stations. They pressed FERC to conduct its most thorough environmental review and said the risks to safety, health and the climate of this venture far outweighed jobs, tax revenue and corporate benevolence. Most were from Lusby and Southern Maryland, but some had traveled from Montgomery, Howard and Frederick counties, Baltimore and Virginia. “Come to my house, sit on my front porch swing and look across the street and imagine the future of my home,” said Rachel Heinhorst, whose front door is a hundred yards from Dominion’s front door. Her three children play football, soccer, Frisbee and catch fireflies less than 200 yards from where the boilers and turbines would be. “Who would put 20 tons of toxic and hazardous pollutants on a neighbor’s lawn?” asked Bill Peil of Dunkirk. Hearing no takers, he continued: “That’s what’s going to happen every year” if Dominion’s plans proceed. And that would be in a routine year, never mind an accident. Many of the pollutants are carcinogens, he said. “Unfortunately, the word carcinogen is not mentioned” in FERC’s environmental review. “This is not about jobs,” said Marcia Greenberg of St. Mary’s City. Although everyone is concerned about jobs, she said, “Dominion has turned this into a discussion about jobs.” She voiced her outrage that the commissioners weren’t present. They have “a huge responsibility” to balance the facts in this divided community, she said. For six and a half hours, the FERC staff called on speakers according to names on sign-up sheets at the entrance to the school auditorium. By the end, 105 people had spoken, 38 in favor, 67 opposed and urging the more stringent environment impact statement. Dominion said on its Facebook page that 75 to 80 percent were in favor. Which is wrong even if Dominion counts the 50 comment sheets that one proponent turned in. Wachholder, from FERC, had sharp remarks for only one speaker: Mike Tidwell, executive director of Chesapeake Climate Action Council. The day before, Tidwell told the FERC staff, the state Public Service Commission had ruled that the proposed project would provide no “net benefit” for Marylanders. For causing higher utility bills, the PSC ordered Dominion to pay $400,000 a year for 20 years to help compensate low-income families. For contributing to climate change, Dominion would have to pay another $40 million over five years into a fund for renewable energy. But the PSC approved the permit for the on-site power plant. “It’s inconceivable that FERC doesn’t see the hazard” of this plan, Tidwell said. “FERC seems to not want to see how hazardous this is….Why wouldn’t FERC want to quantify the risk?” He criticized FERC’s failure to consider the consequences of fracking: “If fracking weren’t happening, what would Dominion export?” He called FERC’s environmental assessment a failure and said the people in Garrett and Frederick and other counties across the state want a similar public hearing. “NO. We are not doing that,” Wachholder said sternly. 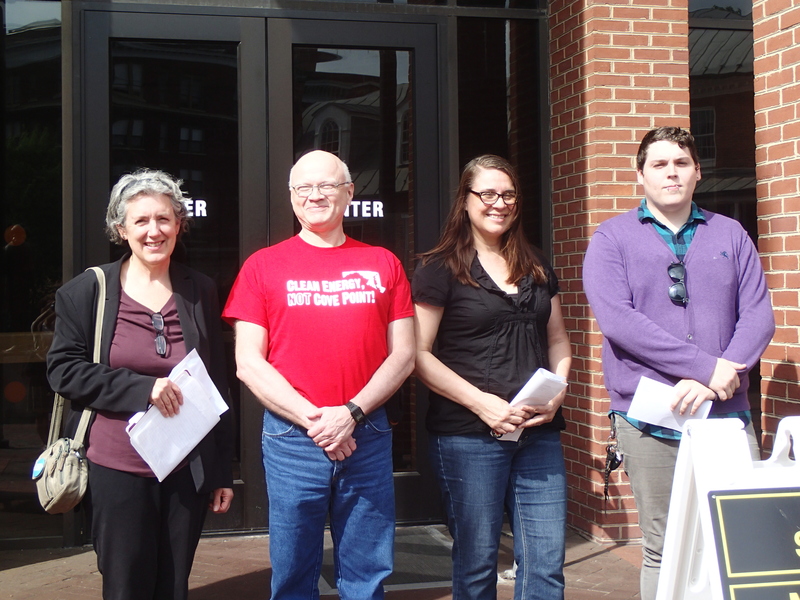 Our action was one of several protests opposing Virginia-based Dominion Resources’ expansion plans in Maryland, including a compressor station in Myersville and a fracked-gas liquefaction and export facility at Cove Point in Lusby. We know who is really disturbing the peace and hindering safe passage through our communities. Not the Frederick 4 or the Cumberland 4 or the Calvert 6. Just hours after our sentencing, the Federal Energy Regulatory Commission (FERC) released its 242-page environmental review for Cove Point. Despite pages of discussion about deflagration (when a vapor cloud “encounters” an ignition source) and fireballs, of fragments flying through the sky “at high velocities” and shock waves, of radiant heat and unconfined ethane and propane clouds, FERC has concluded that all this will be taken care of. Not to worry. Also deemed speculative was the “No Action Alternative,” because FERC has to consider that only if it does the most thorough type of review. 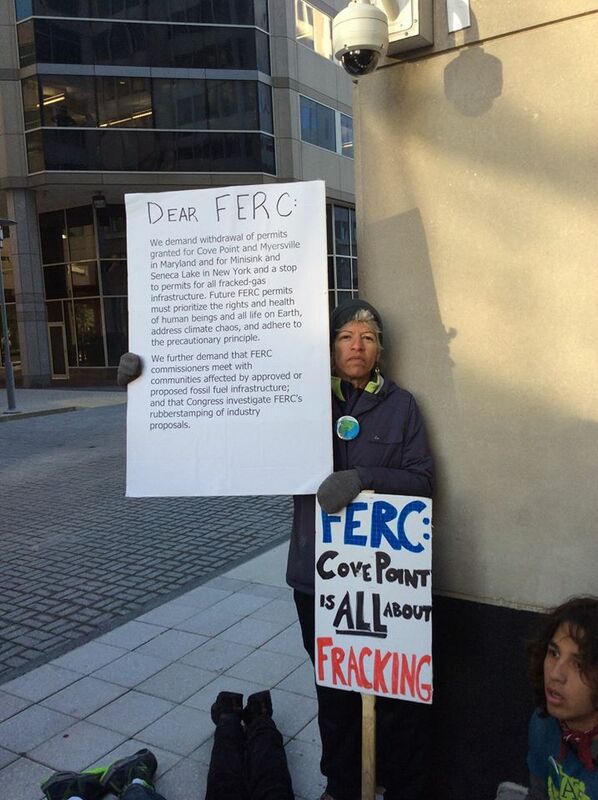 FERC has decided this lesser review is sufficient for the Cove Point project. 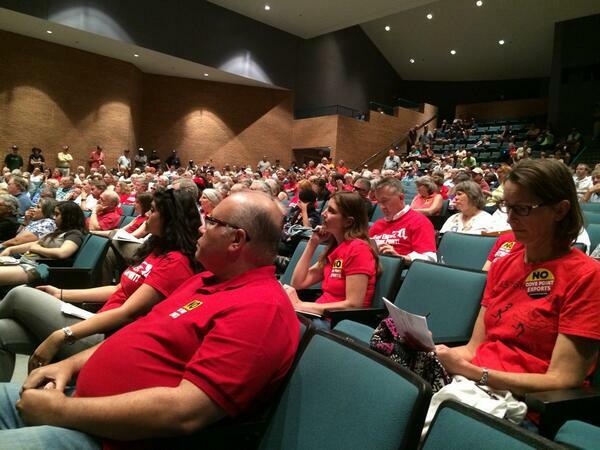 We get one public hearing to object to this report: Saturday, May 31, 1 – 6 p.m., Patuxent High School, 12485 Southern Connector Boulevard, Lusby. Last week, the Obama administration released the latest National Climate Assessment, which shows that climate change is happening here and now, not just in far off lands and in the future. Although that has begun as well. More deluges, droughts, heat waves, wildfires and rising seas are upon us. Scientists also released a report showing that the West Antarctic ice sheet has begun an inexorable retreat. The cause of all this chaos: our insistence on exhuming and igniting fossil fuels to power our economy. Which was fine (for some) — until we realized it wasn’t. Although FERC repeats this fallacy in its report, fracking is not a bridge fuel. Once the frack pads and wells, pipelines, compressor stations and export facilities are in place, fracked gas will be an endless highway to an environmental, health and climate disaster. The path of extreme energy extraction is part of the business-as-usual strategy. It’s utterly inadequate. 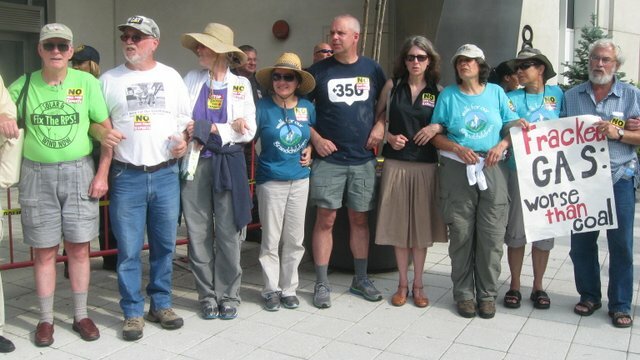 Before our sentencing, we asked about serving our time with, say, Sierra Club, Myersville Citizens for a Rural Community, HoCo Climate Change or Chesapeake Climate Action Network (CCAN). Our CCAN-provided lawyer, John Doud, said not to push it. So be it. Better, perhaps, to work with an unrelated group. We can learn of their struggle. And tell them of ours. I’m thinking recruitment. While they’re in town this week, Dominion officials and shareholders should stop by Cleveland’s Grdina Park. That playground marks where three shiny spheres and a giant cylinder once held millions of gallons of liquefied natural gas (LNG). They were a technological wonder in 1944, because 600 times more natural gas could be stored when liquefied at minus 260 degrees F.
But on Oct. 20, 1944, a spark ignited gas vapor seeping from one of the tanks, unleashing a fiery explosion. Homes along 61st and 62nd streets burst into flames, trapping residents. The gas flowed into the sewer system, launching manhole covers, bursting pavement, rushing into basements. Numerous blasts and waves of blistering heat shattered windows miles away. Telephone poles smoked and bent, grass caught fire, walls turned red, people’s shoes felt as if they were melting. 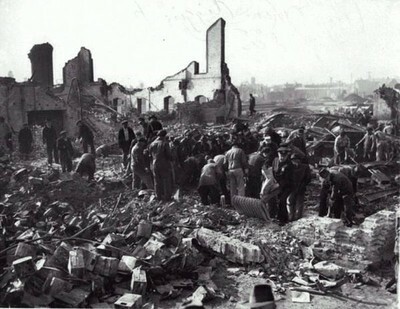 The East Ohio Gas Co. disaster left 131 people dead and hundreds injured. It destroyed a square mile of Cleveland’s east side, including 79 homes, two factories, 217 cars, seven trailers and a tractor. Nearly half the victims, including 21 never identified, are buried at Highland Park Cemetery on Chagrin Boulevard, where a monument honors the dead. If children had not been in school, the toll would have been much higher. After the disaster, public utilities started storing natural gas underground, in depleted wells, rather than as potential bombs in aboveground tanks. This week, on May 7, less than four miles from Grdina Park, Dominion shareholders will consider dazzling CEO compensation packages and lucrative projects, including the proposed Cove Point LNG export plant in the Chesapeake Bay community of Lusby, Maryland. This $3.8 billion facility would liquefy fracked gas, pump it onto tankers and ship it to Asia. But fears about explosions, thermal blasts, and limited escape routes dominate the debate. This facility, if approved, would once again place LNG tanks and much more next to too many people. Opponents have raised numerous objections. The facility would ensure more fracking, compressor stations and pipelines. Exports would also raise prices for American consumers and manufacturers. A U.S. Department of Energy report shows that exporting gas harms every sector of the economy save one: the gas industry. And all that fracking, piping, compressing, chilling, shipping and re-gasifying is a climate nightmare. But the most poignant alarms are from Lusby residents who live nearby. So near, in fact, that 360 homes are within a 4,500-foot radius. A vapor cloud, according to a state report on an earlier expansion, could drift nearly that far and still ignite — with a spark from a car, a lighter, a grill — enveloping all in a flash fire. Which sounds too much like Cleveland 1944. The nearest homes are 850 feet away. Confusion is widespread about a 60-foot-tall, three-quarter-mile-long wall around the site. Dominion calls it a sound barrier; documents suggest it would also serve as a vapor barrier; and company officials recently told residents that flames from an explosion could travel up the wall and, thereby, over the houses. The unusual design, confined to the footprint of the existing and dormant import facility, means Dominion has to cram into tight quarters a utility-scale power plant, compressors and liquefaction equipment, and storage tanks for gases and toxic chemicals. Even minor accidents could escalate into a catastrophe. And 1,000-foot tankers would frequently lumber out of port with their explosive load. Dominion insists accidents won’t happen. But residents have read with growing anxiety about the deadly 2004 explosion at an LNG export facility in Algeria, and more recent blasts at gas-processing plants in Washington, Wyoming and at Dominion’s Blue Racer in West Virginia. In April, the local assistant fire chief resigned over concerns that his all-volunteer department lacks the staff, training and equipment to handle a disaster at the plant. Despite all the hazards and questions, the Federal Energy Regulatory Commission is sticking to its lighter-weight environmental review and plans only one public hearing. The Obama administration even wants fast-track approvals for gas export facilities as another hammer in the geopolitical toolbox to use against Russia. Dominion will tell shareholders that Cove Point fits well with this nationwide rush to export gas. Ideally, we would weigh the long-term effects of fracking and exporting on gas prices, our health, foreign policy, the climate. At the least, though, the explosion in Cleveland nearly 70 years ago teaches that LNG facilities have no place near homes and schools, playgrounds and parks, beaches and fishing docks. If they belong anywhere, and that is not a given, they belong in remote areas, not next to neighborhoods. The Frederick Four: me, Steve Bruns, Joanna LaFollette and Sweet Dee Frostbutter. 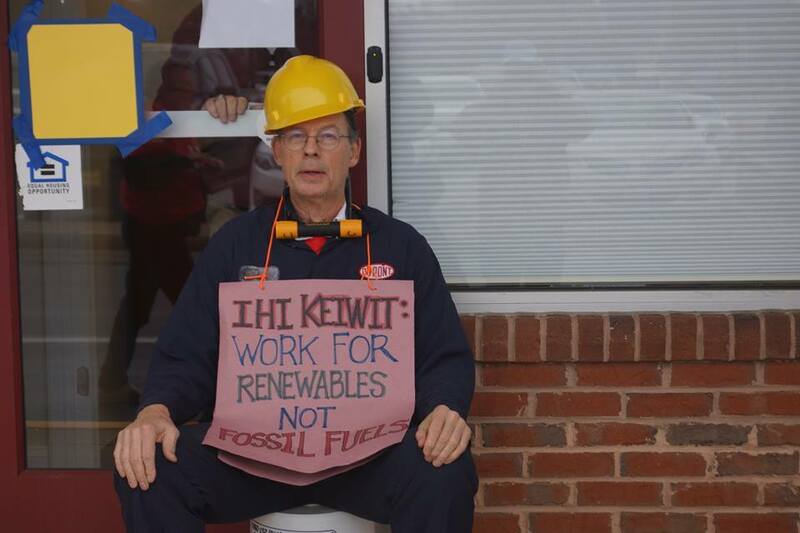 Along with three other activists, I blocked the doors to the Frederick County Courthouse last week as part of a peaceful protest against Dominion’s planned compressor station in Myersville, as well as its proposal to build a $3.8 billion giant facility on the Chesapeake Bay that would liquefy fracked gas and haul it off to Asia. We were the Frederick Four. Dominion’s planned actions are far less peaceful and dignified than ours. In Myersville, one division of Dominion wants to build an oversized, air-polluting compressor station for fracked gas against the wishes of the town’s residents and officials. In Cove Point in Calvert County, the scheme of another Dominion division involves a gas-fired power plant that would yield no power for Marylanders; storage tanks of toxic and combustible chemicals; a long list of air pollutants; and a six-story-tall-by-three-quarters-of-mile-long wall. The super-cooled gas in its liquid form would get to Asia on tanker ships fueled by the dirtiest of oils, bunker fuel, which coats and suffocates wildlife when it spills. This plan too has aroused resident fury, although Lusby officials seem happy to support and deal in secret with Dominion. And the gas for both these facilities would come from fracking all over the Marcellus and other shales that lie under our homes, schools, businesses, farms, playgrounds, parks and rivers. Even though scientists and physicians are raising grave questions about the wisdom of allowing this industry to operate in our backyards, particularly because of the millions of gallons of water laced with toxic chemicals, the noise and countless diesel truck trips. And even though fracked gas is a bridge to a catastrophic 6 degrees F of warming on our planet. 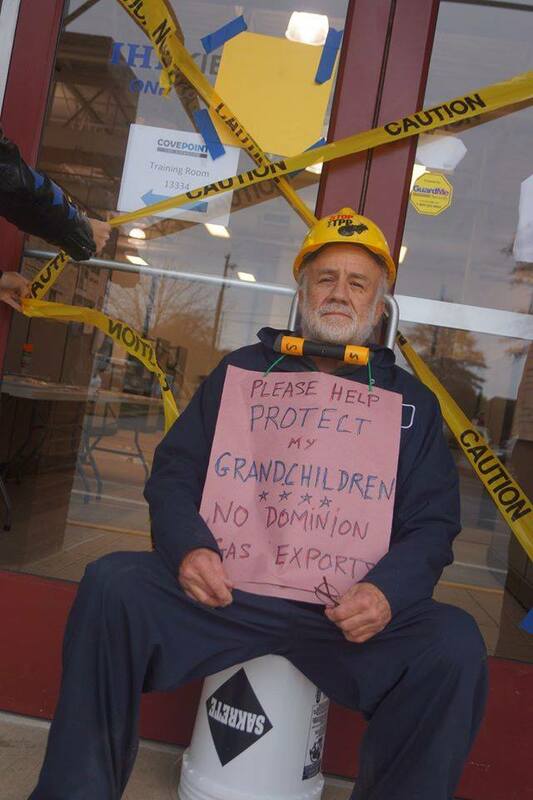 But Dominion’s CEOs won’t be pondering their willful obstruction of our safe passage in our communities in a 7-by-11-foot dull yellow, concrete block cell anytime soon. 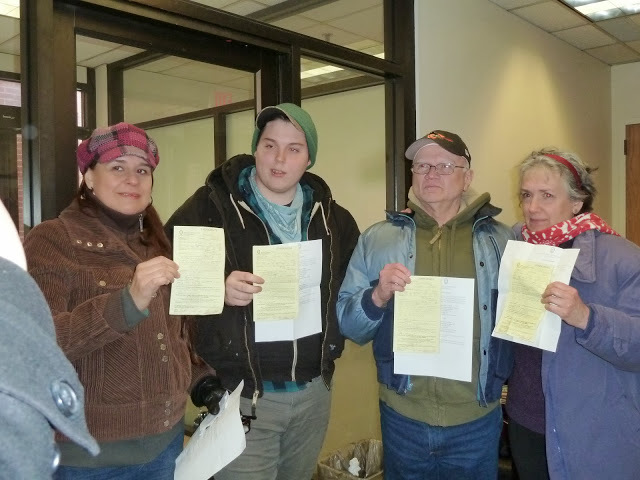 Our civil disobedience action was the second in as many weeks. 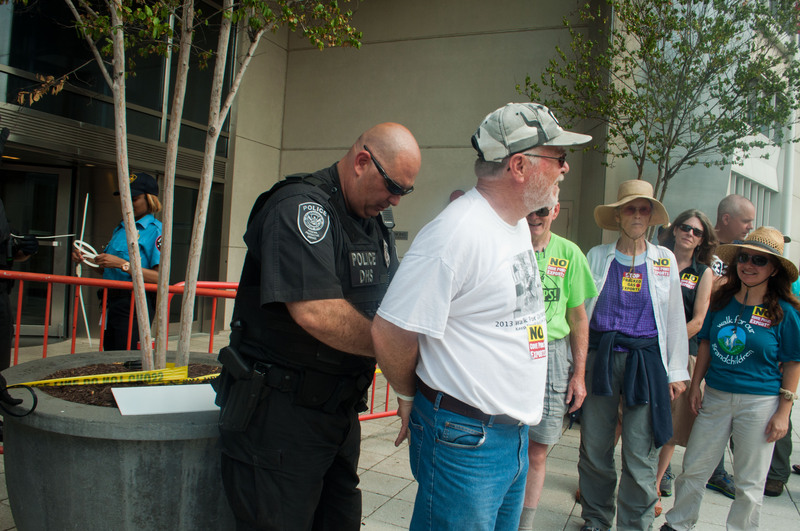 Previously, four activists were arrested in Cumberland. We are making clear that — as much as Dominion denies it — Cove Point has everything to do with fracking and the connecting web of pipelines and compressor stations that would run through our communities. We are saying that rushing ahead with these plans without a thorough environmental review of health, environmental and climate effects puts us all at risk. At the rally before the arrests, we read our statements. 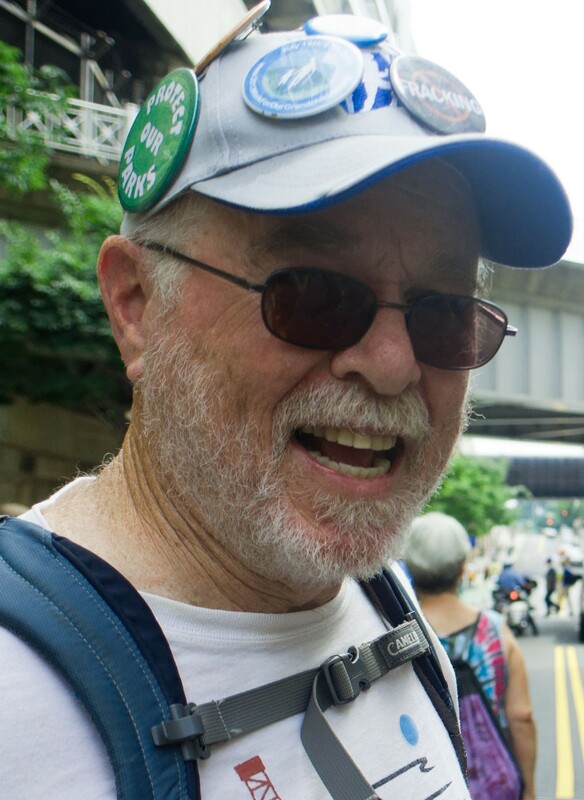 Steve Bruns, who’s running for an at-large Frederick County commissioner seat, blasted the gas industry’s PR campaign to promote fracked gas as clean and safe, as well as Dominion’s lawsuit against Myersville and the Maryland Department of the Environment to force approval of the compressor station within a mile of the town’s elementary school and evacuation center. “This sort of contempt for the health and safety of the people of Maryland is unacceptable in a democratic society. If our government isn’t getting the message, then we’re just going to have to crank up the volume,” he said. Sweet Dee Frostbutter, who grew up playing in the forests and fields of Calvert County and lives in Frederick, said: “This place and these people mean too much to me to stand by and just watch that happen. We have to resist, and I hope you’ll join us!” In June 2011, Sweet Dee was a cook on the weeklong, 50-mile March on Blair Mountain to stop another form of extreme energy extraction: the blasting away of that mountaintop to excavate the coal. The same mountain where, in the summer of 1921, 10,000 armed coal miners battled for the right to form a union against strikebreakers and lawmen hired by mine operators. “Maryland could virtually turn into one large industrial zone and be sacrificed for energy being shipped overseas,” said Joanna LaFollette of Frederick. Joanna, who has asthma in a county that has a mortality rate from air pollution among the highest in the nation, was there in place of her son Dylan Petrohilos, whose arrest for civil disobedience at a frack-sand processing plant in Boone, N.C., was still being processed. After about 30 minutes, one of the officers said we had to leave the plaza because we lacked a permit for a rally. Instead, the four of us risking arrest moved closer to the courthouse to block the doors. We chanted more and tried singing a verse of “This Land Is Your Land.” Eventually, Sweet Dee and Joanna were given one more warning and then arrested. A few minutes later, police gave Steve and me our final warning. And then officers, who greatly outnumbered us, moved in and escorted us about 20 feet to the Frederick City police office, where we were quickly searched for weapons. Sweet Dee and Joanna were booked first and never saw the inside of a jail cell. But Steve and I were put in adjacent concrete-block cells with sliding solid metal doors. Solitary confinement. The only opening on the door was a 4-by-6-inch window. My jail memoir will be short, as I was probably in the slammer about 35 minutes. Eventually, officers unlocked our cell doors and took us to an office for a mug shot and booking. They asked about our action. One officer had read a lot about global warming but said he hadn’t made up his mind about it yet. Another thought nuclear power was the answer. And then we were free to leave. My arrest was a small action. I was trying to help make the future come out differently from the way it’s headed, one small shove to help steer us from fossil fuels and their giant corporate pushers. The Frederick Four and the Cumberland Four are not alone. In August, more than 2,000 people participated in a days-long campaign against fracking in Balcombe in the United Kingdom, including 20 who blockaded the headquarters of energy company Cuadrilla and six who superglued themselves to the doors at the London headquarters of Cuadrilla’s PR firm, Bell Pottinger. Last June, in Zurawlow, a rural community in Poland, 150 farmers slept in fields and blockaded a drilling site with cars and trucks. In the fall, farmers in Pungest, Romania, cut cables laid for seismic testing, scooped them up and dragged them through the street to protest Chevron’s plans for fracking on their land. They also formed a human chain around the land where Chevron wanted to place test drills. “We have to do these kinds of things. It’s our duty,” one farmer said. They don’t want fracking for “schist.” Even though Chevron offered the Romanian farmers T-shirts and yogurt — a ploy wackily similar to the cheese pizza Chevron offered residents in Greene County, Pa., after a well pad explosion and fire that burned for days and killed one worker. Note to Chevron: Communities want clean water and a safe place to live, not free dairy products and clothing. Also note: Schist and fracking. In any language, it sounds like a curse. Sometimes, civil disobedience is our only currency. We don’t have millions to spend on disingenuous television, radio and Web ad campaigns about “clean” energy that really isn’t and “jobs, jobs, jobs, jobs, jobs, jobs” that are inflated and too often in the rescue, emergency and mopping-up industries. Sometimes all we can do is get in the way, slow the machinery, free our voices, give the science time to catch up and emerge. Civil disobedience has been key to many justice movements, from Alice Paul and Martin Luther King Jr. to the many anonymous protesters who sat in at factories, lunch counters, nuclear facilities and treetops. As folksinger Anne Feeney would say, I’ve now “been to jail for justice” with the Frederick Four. The battle against fracking and Cove Point is now part of the justice movement to save life on the planet from catastrophic warming and, along the way, create energy forms that don’t bring sickness and misery to others. And the window for acting is small, not unlike the one in my jail cell door.